Around the office here, we’re all a bunch peace-loving folk. Most of us wouldn’t hurt a fly much less raise a sword against our fellow man. Unfortunately, history is rife with war. People just couldn’t settle their differences with words. They had to don some battle gear, pick up their longsword to clash weapons against one another, and shout battle cries at each other. The fate of an entire kingdom would be decided based on the actions of brave warriors on the battlefield! Why, we even hear that they used to fight each other with dragons! Okay, so maybe we’ve read one too many medieval fantasy novels! Despite our peaceful nature, there is a part of us that yearns to live the life of a warrior, even if it’s all just an act at the next costume party. The good news is that this Warrior Tunic gives anyone the opportunity to feel like a medieval warrior and you don’t even need to fight anyone. This adult tunic comes with a black tunic that has a faux leather, textured front, making it almost appear like leather armor. The front has lace-up string to help you adjust the fit. Just pair it up with a pair of simple pants and a toy sword and you’ll be well on your way to conquering your enemies… or at least you might be able to conquer the costume contest at your next party. This tunic is the ideal start for anyone trying to craft their own medieval swordsman costume. 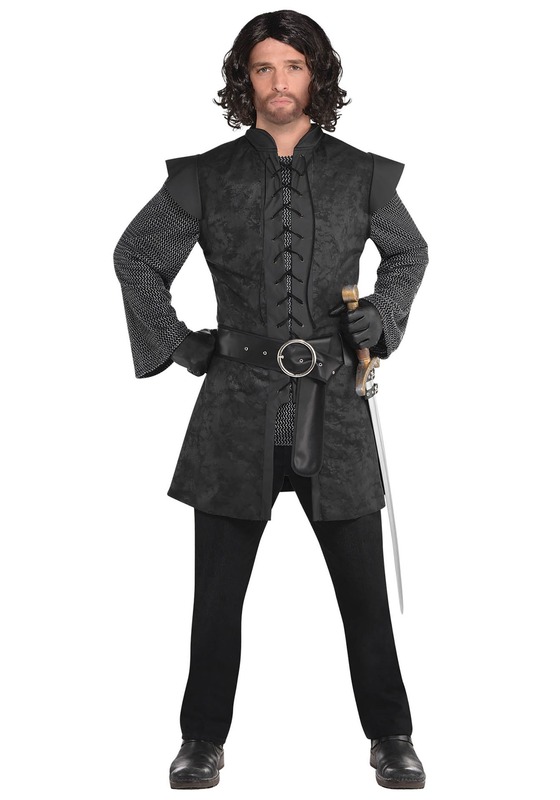 We carry plenty of toy swords and shields to help outfit you for your next costume party. We even have a large selection of wigs that you can pair this tunic with. It’s really up to you to decide how you customize with this tunic costume.